4 Passenger Street Legal Cart Included! 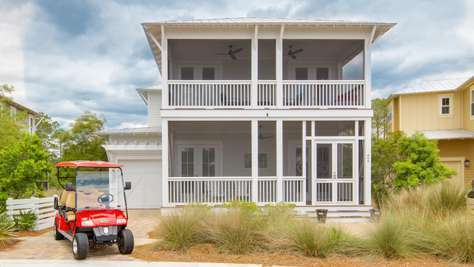 Cart can be driven to beach, Seaside, grocery store, restaurants, all of Seagrove Beach. New home!! Ready for guests spring 2019, no construction nearby or on same street. Only construction in Naturewalk is in phase 3, which is north on Sandgrass Blvd; away from other homes. 30A is a beautiful, scenic, truly unique 19 mile stretch of paradise (with bike path) that runs parallel to the beach and is comprised of many communities. Amazing white sand, rare coastal dune lakes, Grayton Beach Park, excellent restaurants, spectacular homes, and good old southern hospitality! Welcome to Beach Lessons - Naturewalk at Seagrove. New home with brand new furnishings, beds, decor, located in phase 2. Completed late summer 2018, ready for guests spring 2019; no construction nearby. You will love the natural lighting and spacious first floor design. Corner lot with large driveway, garage and 4 passenger street legal cart. Cart may be driven on roads where posted speed limit is 35 mph or less. The areas where cart is permissible to drive include west on 30A to Seaside, Grayton Beach and east into Seagrove Beach. Laws are same as driving a car. Always use seat belts, turn on head lights during the day, use turn signals, drive safely, park in normal designated automobile parking spots. Spacious 1st floor, kitchen has large granite counter perfect for entertaining & eating; half bath & 2 porches. Stainless steel appliances, gas stove top, 2 comfortable sofas and dining table seating 6. Plenty of natural lighting all throughout the home. Upstairs, guests will be welcomed by 4 bedrooms, 2 baths and a washer/dryer. Bedroom # 2 - Bunk room in Bedroom #1 - max weight per bunk bed 150lb. Bedrooms 3 & 4 share a hallway bath. Bath has 2 sinks and tub/shower combination. NatureWalk's ‘Gathering Place’ features a zero entry lagoon style pool, heated lap pool, hot tub, small kids splash pool, children’s playground, fire pit, 2 outdoor gas grills, self entertainment bar, hammocks, bathrooms, shaded seating with tables and chairs. Basketball court is located on west side of Flatwoods Forest Loop. Boats, watercraft, atv's, trailers, rv's are not permitted in Naturewalk. Cars must park in driveway or paved parking spots along the side of street. 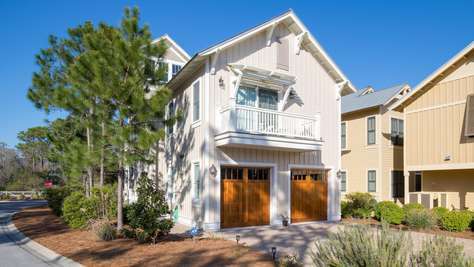 Interactive Floorplan, use link below, choose GRAYTON, then BACK arrow to return to DESTIN 30A RENTALS site. Phase 2, no construction. Construction is in phase 3, which is north on Sandgrass Blvd, away from phase 1 & 2. Beautiful new 4 bedroom home with 6 passenger golf cart on extra wide lot with carport and extra off-street parking space. 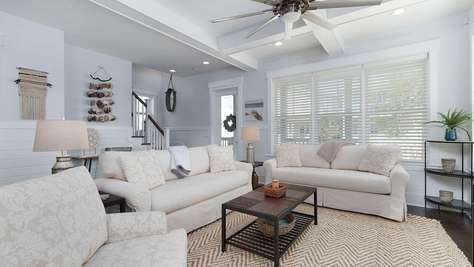 Bright white beach exterior with Adirondack seating on an open front porch with ceiling fans for warm beach days. 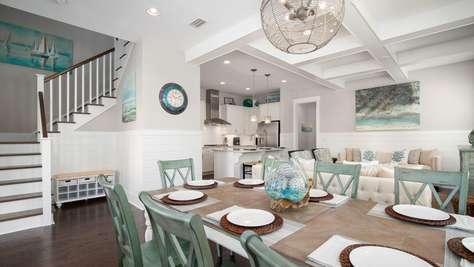 Interior décor has a contemporary coastal design with shiplap and soothing colors. The first floor features a bedroom with a king bed, television and connected bathroom with walk in shower. 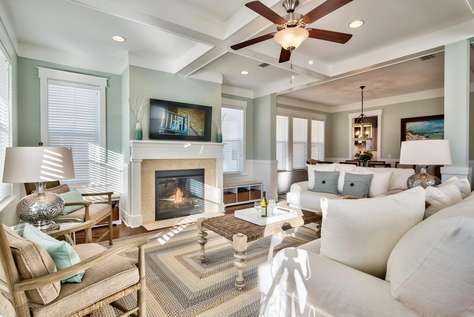 The living area with a large screen 4K TV/AppleTV has an open floor plan including the kitchen and dining areas. Regular drip and Keurig coffee makers provided, waffle maker, pancake griddle, Alexa Echo Dot. Fully equipped kitchen with adjacent 1st floor laundry. A screened rear porch with TV, comfortable seating, curtains for shade and privacy and ceiling fans add to the large living area. Features include a game closet, wooden shutters, ceiling fans, Keurig, coffee maker, toaster oven, stand mixer, gas grill and outdoor shower. Upstairs features a master suite with a king bed, TV, screened porch with seating and curtains for privacy and large master bath with 2 mirrored vanities, soaking tub, shower, and walk-in closet. 2 additional bedrooms each feature a queen bed with TV’s and one shared full bath with full tub/shower and double vanity. An additional bunk room space in upstairs landing area offers a twin over a full bunk with trundle \ tv and sitting area. In the Key of Sea also features a 6 passenger, street legal, electric golf cart for guests (driver must have a valid driver’s license and be age 21 or older). Seatbelts MUST be worn at all times by driver and passengers. 1st phase of Naturewalk - No construction! Construction is in phase 3, which is northern part of Sandgrass Blvd; a separate area from phase 1 & 2. Strictly Enforced; thank you for understanding and caring for home. Beautiful 4 bedroom 3 bath with upstairs bunks (twin over full) in landing area, 2 minute walk to pools. 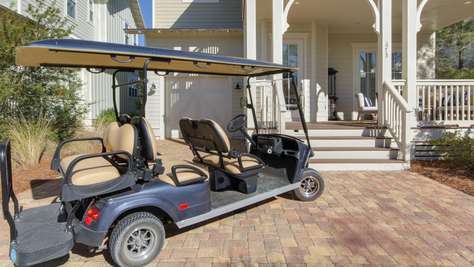 6 passenger street legal golf cart included. 4 screened porches, gas grill, 4 adult bikes, beach chairs, umbrella, outdoor shower, private backyard. All rooms have televisions, dvd players. Upstairs landing area with bunks includes a television, x-box 360 and ps3 players (no games). Kitchen is fully equipped, gas stove top, stainless appliances, regular and keurig coffee makers. A few games, books, high chair, pack & play, baby gates, and 2 chair toddler wooden table available. Wireless internet, basic cable, beach chairs, and a few toys provided for your enjoyment. Bedroom #1 is on the 1st floor. A king bed that has a full bath and access to front porch. Bedroom #2 is upstairs. A king bed, porch access, shares hall bath. Bedroom #3 is upstairs. A queen bed, porch access, shares hall bath. Bedroom #4 is upstairs. A king bed, private bath, private back porch overlooking natural preserve. Upstairs landing area has 2 bunk beds, twins over full, television, gaming systems, and curtains that can be used as added privacy to close off this area. Name of home is Southern Comfort. Phase 1 - no construction. Construction is in phase 3, which is north on Sandgrass Blvd away from phase 1 & 2. Main living area on 1st floor now has 2 sofas and 2 side chairs; spacious home and each bedroom has a private bath! 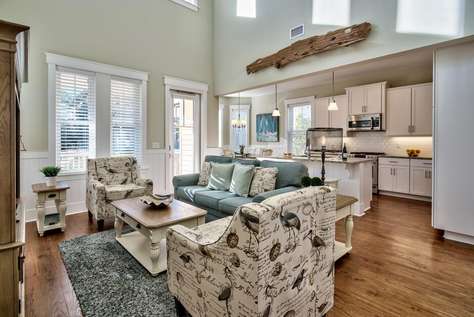 Welcome to Southern Comfort in Naturewalk at Seagrove. 4 bedrooms and each bedroom has private bath! Corner lot, 3 minute walk to pools, 1st floor king, several balconies and porches for your relaxation. The 3rd floor provides a cupola which is perfect for relaxing or enjoying the view. Well appointed kitchen with stainless appliances, gas stove top, granite, table and seating. Living and dining area have plenty of seating, gas fireplace, and first floor king with private bath. For you convenience, a side entry near kitchen or use front door. Outside gas grill provided for cooking out. Lovely and comfortable side patio next to kitchen and grill. Drip coffee maker and Keurig, along with a fully stocked kitchen add to your experience. Upstairs on the second floor offers 3 more bedrooms, 2nd living room with television, washer/dryer, desk with printer. All bedrooms have televisions. Bedroom #2 has bunk beds (4 twins), private bath. Bedroom #3 has a queen size bed, private bath. Bedroom #4 is the king master, large room, personal Keurig coffee maker, private balcony, private bath with shower and tub. Shower has 4 body sprays, 2 overhead rain shower ports, regular shower head and hand held. All controlled by a digital computer system for personalized control. Tub is walnut trimmed, Jacuzzi and Whirlpool hydrotherapy with chromo light settings, contolled by a single pad mounted on wood trim. Southern Comfort also provides a 1st floor front porch, side porch off of kitchen, second floor has a front porch and small side balcony near living area. King master suite has private balcony. 3rd floor offers a peaceful lookout tower which is perfect for napping, reading, catching the sunset or gazing at the stars. No garage access. Lily Lane beach trail (bikes/walking) is located across from the ‘Gathering Place’. This is a safe, wide, compacted trail that leads to San Juan Ave. San Juan Ave is a dead end street with a sidewalk that leads south to 30A. South San Juan beach access is directly across 30A, has limited parking. Bramble/Santa Clara beach access is about 500 feet east and has a large parking lot with bathrooms. Just under a mile or 7 minute bike to public beach access.